I am not a huge fru-fru person. I prefer practical over fun. It's just how I roll. 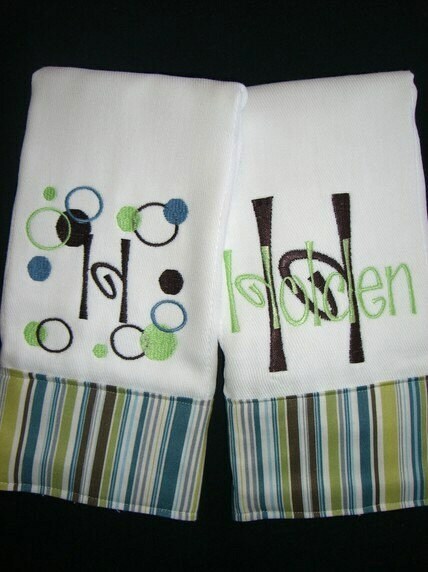 However, when it comes to baby stuff, I like to have a few custom things, if for nothing else than to have that name on the things that can be mixed up easily at the church nursery. I thought it'd be fun to show you some of the stuff that has caught my attention lately. 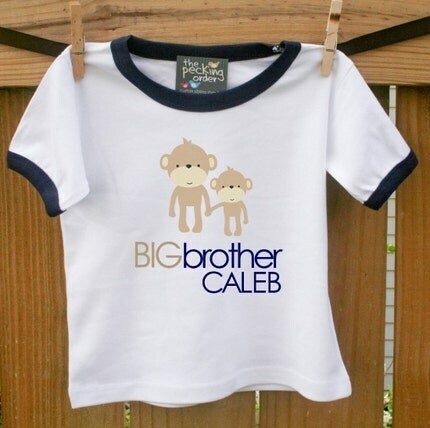 The BIG word is actually going to be baby blue, and the shirt will be a raglan baseball shirt for B, and a onesie for Connor. Isn't it adorable??? I actually purchased a diaper clutch from Baby Coverz for Brayden before he was born. I love having it to just throw in his diaper bag (or actually his big boy backpack now) and keeping the diapers separate from everything else. I plan on getting one of these for Connor too. I'm thinking I may get a bag tag for Connor's diaper bag. I think they are SO cute, and are definitely needed since all childcare facilities require all things to be labeled/personalized if you plan on leaving it with your kids. I think Label Your Stuff has cute bag tags... I like the Polka Dot design. OK, so there is a slew of other stuff, but that's my simple list. What custom baby stuff do you love? Do you have a favorite etsy seller that sells stuff like this? I'd love recommendations because I haven't purchased anything yet. And just for the record, these business have no clue I am making this post. I'm not compensated in any way by writing it. I just think their stuff is cute so I thought I'd share it with you, my readers.